After cracking jokes on stage during the Game Developers Choice and IGF awards at GDC last night, Double Fine boss Tim Schafer had almost completely lost his voice, but he still croaked his way through his annual appearance on Kotaku Splitscreen. 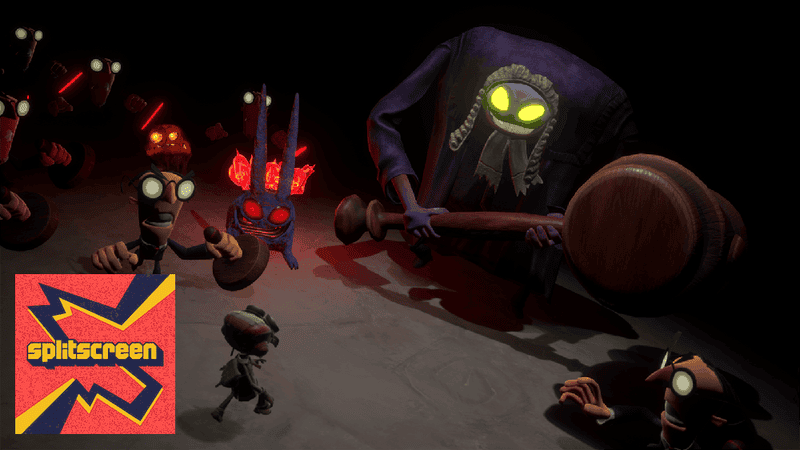 Jason and I talked to him about the unionization joke he told at the awards show, as well as Double Fine’s newly announced game Rad, the much-anticipated Psychonauts 2, and the idea of a subscription service for games. In the second half of the show, we talked to Gabe Amatangelo of QC Games about his former career at Bioware, where he worked on Shadow Realms, a role-playing game that pitted four cooperating players against one other super-powered player. It got canceled, and now QC Games has made a Shadow Realms inspired dungeon crawler called Breach, which launched in early access earlier this year. Jason: You guys make such terrible games. Maddy: Yeah, do you have anything you’re just gonna poop out? Jason: But it’s this idea of—we’ve been doing this for so long, making all these games that are critically acclaimed, but never break out. Never Apex Legends. Tim: Can I put that another way? Thinking about each game, where you’re not make-or-break on every single game and chasing after the ultimate market share on every game, is appealing. That’s how I would say that. Because often it’s like, “Okay, now we gotta try and do a battle royale game.” We’re not doing that. Jason: That’s what Psychonauts 2 is, right? A battle royale game? That wold actually be pretty cool, a Psychonauts battle royale. Maddy: Yeah! Could you make that, do you think? Tim: Yeah, Psycho Battlefield! All we wanna do is follow our inspiration. Get a great idea for something we care about, like Lee [Perry] did with Rad, and just pursue it. And I think those kind of things would be able to find their audience in a place where everyone’s not doing this whole $60 decision and you’re battling for space. There is an appeal there. There is also an appeal to being independent and being able to do whatever you want. Jason: Something that comes to mind immediately is, every couple of years, you guys do something called Amnesia Fortnight. Is that coming up soon, by the way? Tim: I’d like to do it after we ship Psychonauts. Jason: Got it. So that’s where you all stop everything you’re doing for two weeks and you just work on prototypes, and you guys figure four different prototypes. Tim: Yeah, and we used the word “fortnight” before anyone else did that. I’m hoping that people will find our thing by searching for—but we spell it correctly. So that messes it all up. Jason: Wait, when did you guys start Amnesia Fortnight? Jason: Oh, okay. Because Fortnite was announced in 2011, so you beat them way to the punch. Tim: We’re thinking about suing them. See what we get. Jason: As you should. Everyone’s suing Epic these days. Tim: They stole my dances! Jason: But I could see something where you put out these prototypes—like you’d have a subscription service, this Double Fine library is on there. Tim: We talked about that for a while. Especially after our Kickstarter we did for Broken Age. These people were like, “We love everything you do!” We had this really engaged community, and they were very supportive, and a lot of them were like, “As long as you think this game’s gonna be good, then I want it.” And we were like, “We should just offer a subscription.” But it gets into, how often are you shipping games? And are you shipping enough to make it feel like that? I mean, we could. But we’re lazy. It’s a lot of work. Tim: I mean, we’re busy making games. We don’t have time to think of these things! Jason: “Game developers are lazy.” Quote, Tim Schafer. Tim: [laughs] We thought of it. I couldn’t figure out how to actually do it. But sometimes you can be pushed to these things. When the Kickstarter happened, I was like, “I don’t know what that is. I don’t know how to do that.” And Greg and the 2 Player guys bullied me, frankly. Bullied me into it. Maddy: And so if they all suddenly were like, “We need a Patreon for Double Fine.” You’d be like, okay. Tim: Wow. Boy, are they forming a union now? Jason: They were not. They should be.